Not quite as much as I'd hoped but I've had a stinking cold and have gone to bed early all this week! I'd hoped to complete both olive leaves at the bottom this month. 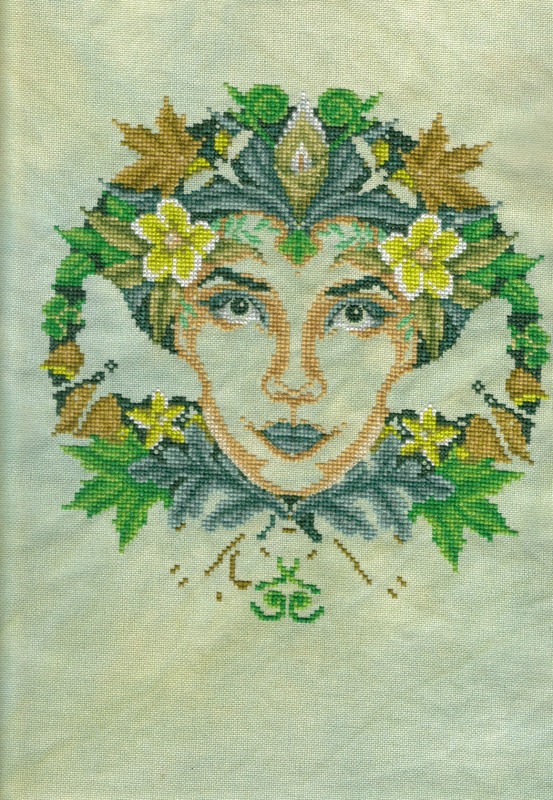 The other Jardin themed piece is my Joan Elliott Round Robin based on her Flower Fairies. Here's another picture, this time taken during the day so the colours are a little better than the previous one. Lots of scope there! 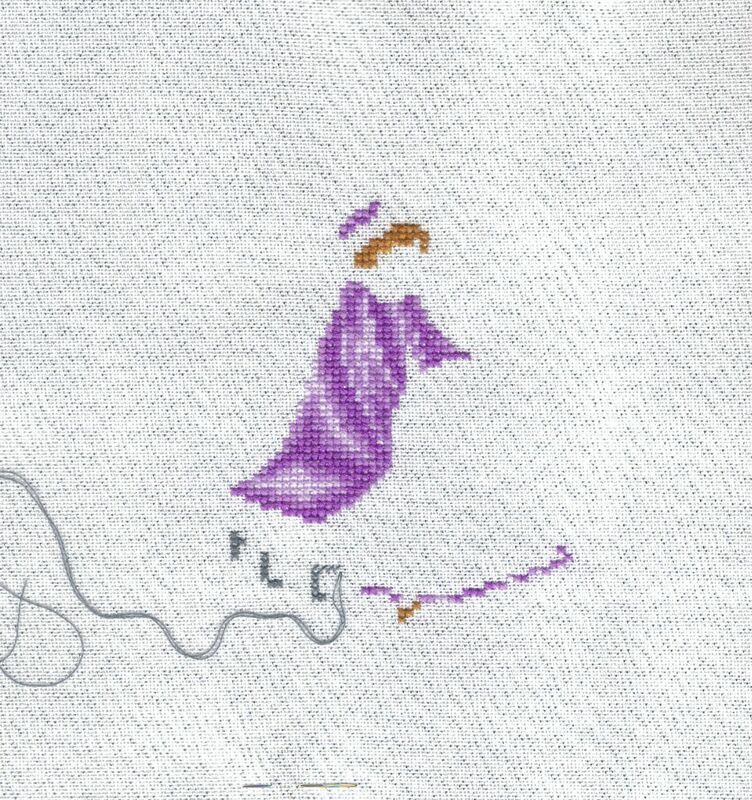 I have the Large Mirabilia RR to start, I received Julie's piece "In the Arms of an Angel" last week and I'm really looking forward to stitching on this one. Of course GG is a person, and the JE Diary February design is a chubby cherub so that count's too. Talking of Julie, she has a new blog called the Red Couch Stitcher so pop over there and say "Hi from Jo"
Finally, the now obligatory mention of my Secret Stitching Sweetheart Blog Hop. You really have no excuse for not knowing about this event! Click on the Heart on my side bar for the post with all the details. Open to all, the more the merrier. Spread some Love! This is the Ornament SAL hosted by Stitching Lotus. I have three different ornament challenges running this year, the JBW Alphabet Cat stitched in a different colour scheme each month and the Dragon Dreams 12 Dragonlets of Christmas, a FB exclusive. I stitched an ornie for a dear friend of mine for her Birthday. 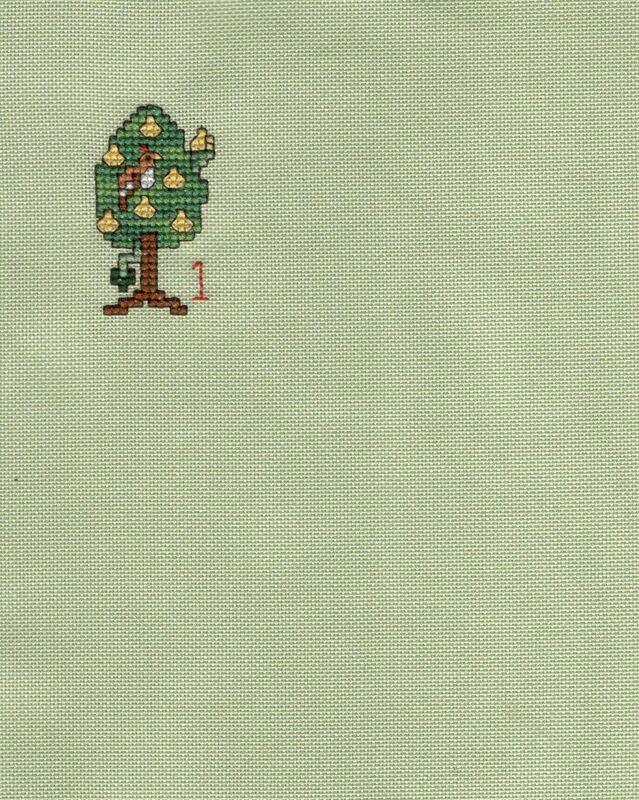 Last Christmas I saw this ornie chart on Leftsox blog and wanted to stitch it but didn't have any green evenweave. Luckily Mouse had a piece and sent it to me. I literally needed less than 3 inches square! In return I promised to make her one. Fast forward to a year later, "I really must make that ornie for Mouse" I thought. "Good job it's her Birthday in January because it won't be done by Christmas." 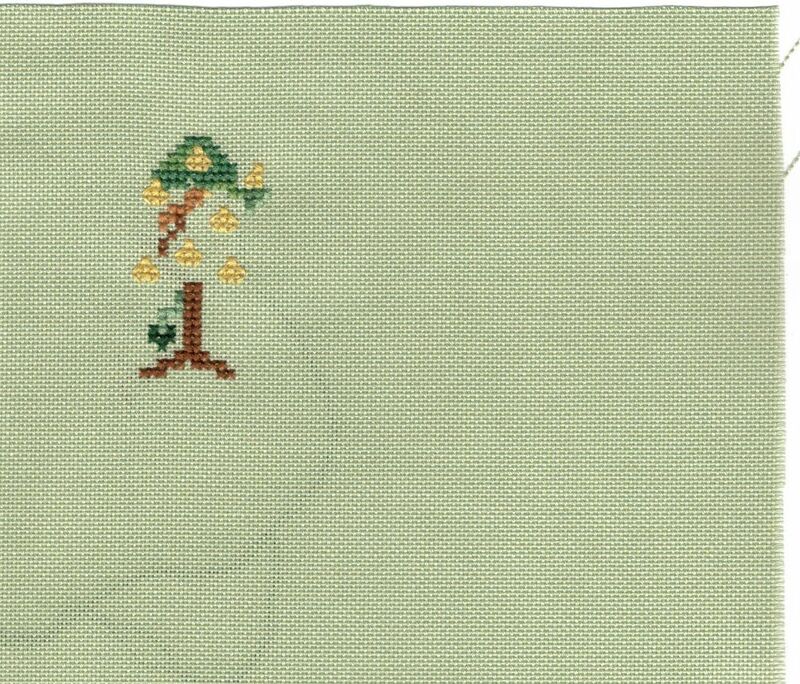 I also stitched the little snowdrop card for her. 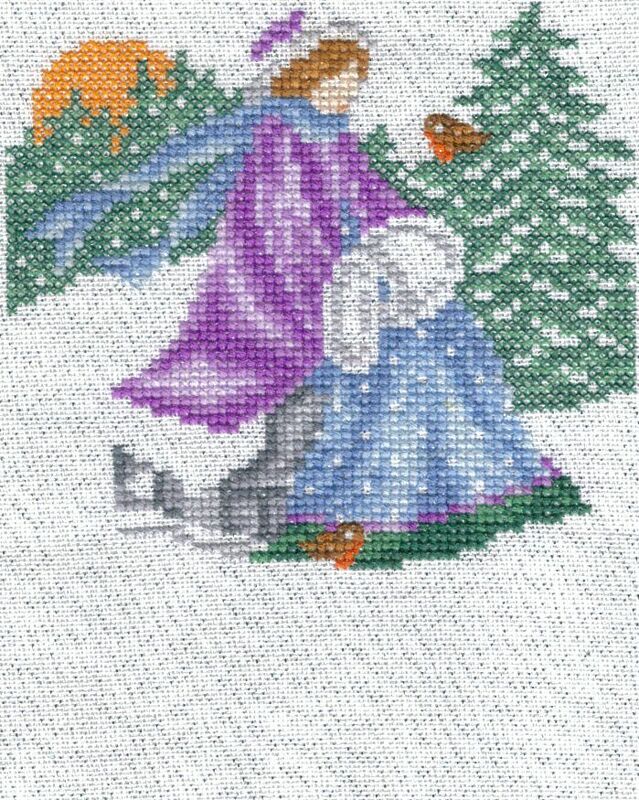 This was a cover kit from an old issue of Cross Stitcher and just right for a Winter Birthday. This is not really an ornament, not at all in fact but it is part of my monthly challenges so I'll include it on this post. 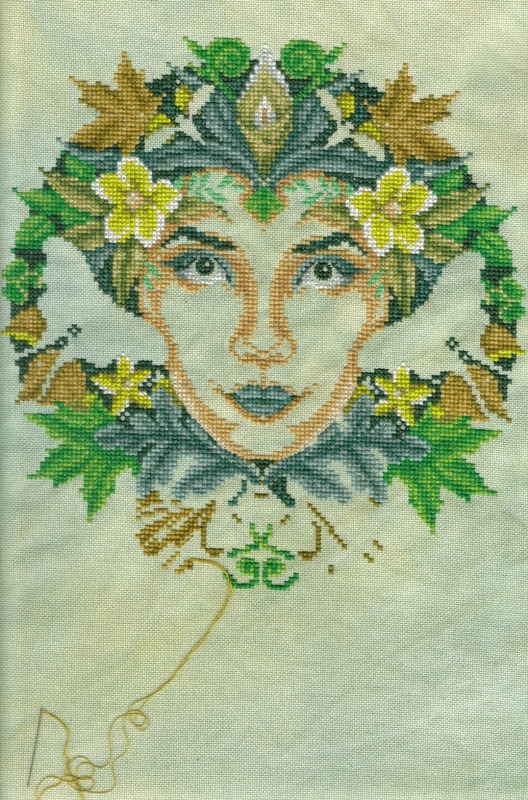 My progress on Joan Elliott's January design from the 2013 Diary. All I've got left is the pale grey and white of the snow and the backstitch and she's finished. These designs take a while to stitch as there's alot of detail so I've rethought my plans. 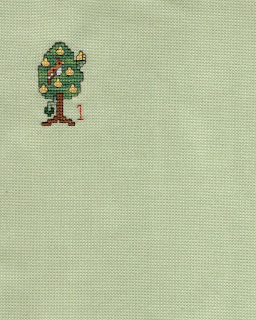 Originally I intended to stitch all 12 but I think I'll skip the three pixie themed ones as they're not really my taste. That leaves 9 designs of approximately 3 weeks stitching time so 27 weeks, about half of each month's daytime stitching will be spent on these. That leaves the rest of the month for the cats, the dragonlets, the NH challenge and any cards. hmmmm. we'll see!! Finally, I've received a few pictures for my Valentine Blog Hop already. You have until the 10th to email me your photo to confirm your sign-up. 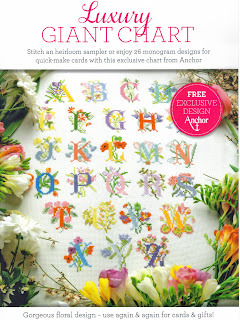 Giovanna has been helping me find some lovely freebie Heart designs so I'll do a little round-up of those soon. To read about how to join in, click on the Heart at the top of my right hand side-bar. 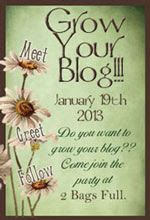 Blog Hop is open to all, old and new followers alike. Way back in August 2011 I put a post up on the Yuku Board, "anyone interested in doing a Joan Elliott Round Robin in 2012?" Several people were and seven of us made the committment and spend last year stitching away on our pieces. 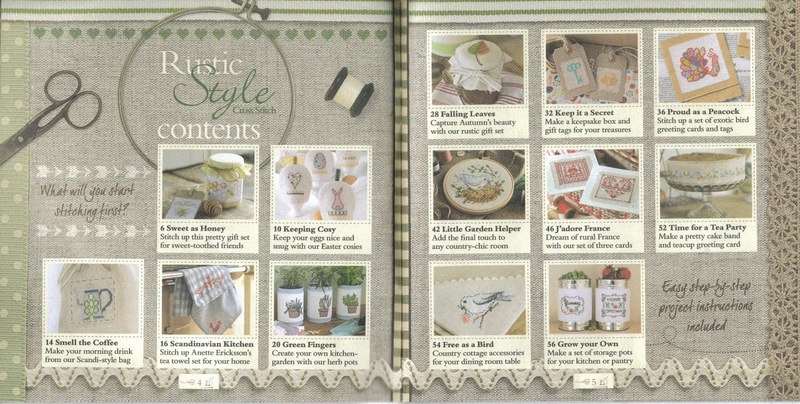 You can see the round-up of the designs I stitched on everyone else's on this post here. 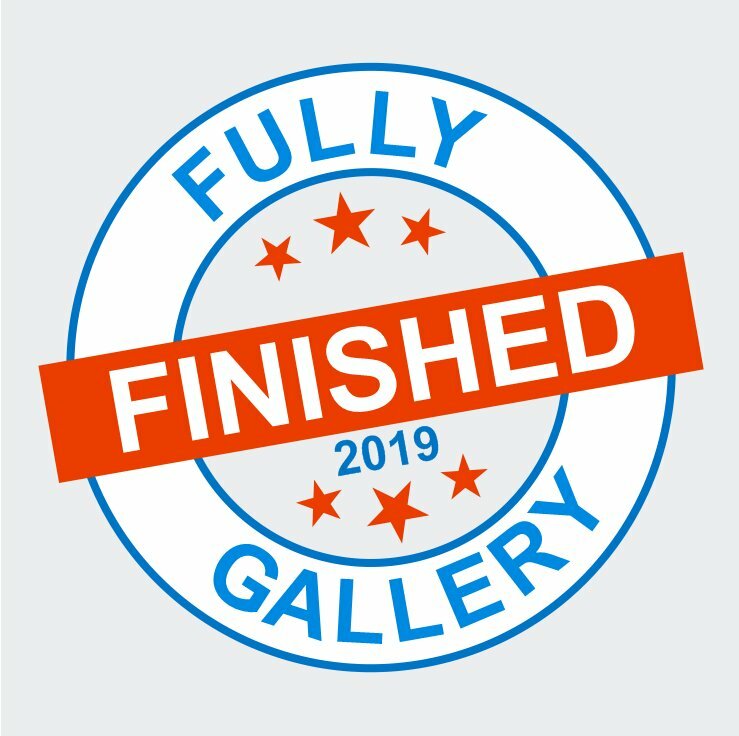 Now it's time to show my completed piece! Mine took a little time to come back as one stitcher had a family illness to contend with so she was allowed extra stitching time. I completed the centrepiece last night and added the title plus my name. not the best photo but I'll try get a better one for my Happy Dance blog. The fabric is actually pale green! 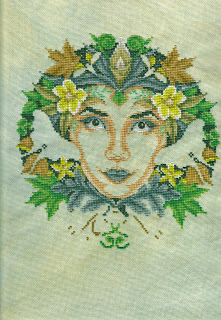 There is going to be a 2013 Joan Elliott RR, but I'm not taking part this year due to other stitching commitments. So if you'd like to sign up then you'd better be quick about it!! 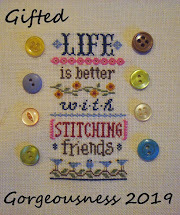 Finally, don't forget to sign up for the Secret Stitching Sweetheart Blog Hop. Click to heart to go to the sign-up post. 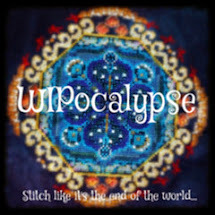 Welcome to the first WIPocalypse post of the New Year courtesy of Measi's Musings. Once again my WIPocalypse has three parts; my 13 in '13, the Monthly Challenges and the Theme-a-licious challenge. As Theme-a-licious is due to be posted on the 31st I'll concentrate on Parts 1 and 2 for this post. I'm just stitching the plain DMC at the moment. I'll go back and complete the Kreinik once that's all done. Isn't Pumpkin Kitty super-adorable? It's a freebie from Silver Cute Dwarf's blog. It's actually quite big and wasn't an easy stitch, there are lots of vertical and horizontal stitches rather than 3/4 fractionals which made counting tricky. 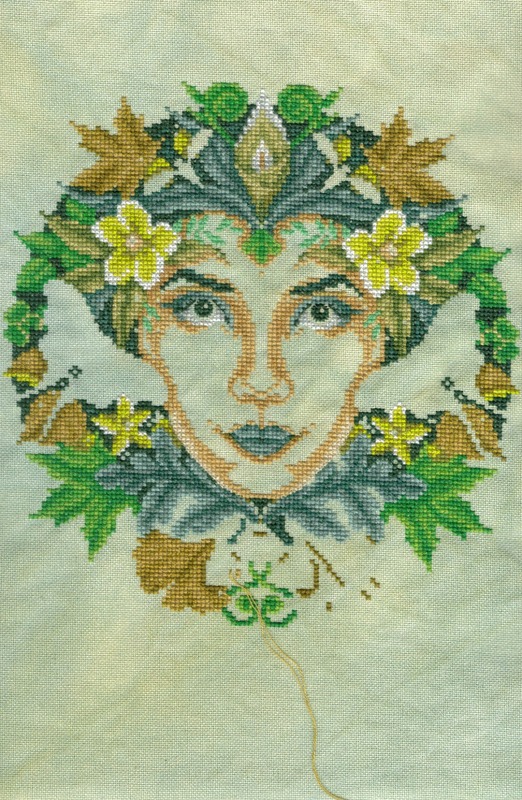 There's alot of stitching hours in this one! Finally, I'm taking sign-ups for the Secret Stitching Sweetheart Blog Hop on Valentines Day. Very simple - just email me a stitched picture suitable as a Valentine for a stitching friend and I'll do the rest! You'll receive an email picture just before the 14th that you must post on your blog. Then we all hop around to find out who got our picture! Click on the heart below for more details and to sign up. Regular followers will have seen the various projects I've stitched for the Needlecraft Haven Monthly Freebie Challenge. Each month Christine chooses a different freebie for us to stitch by the end of the month. we keep it secret until the Big Reveal Day on the last Sunday of each month. I thought I'd do a little round-up of 2012 for you all to see. 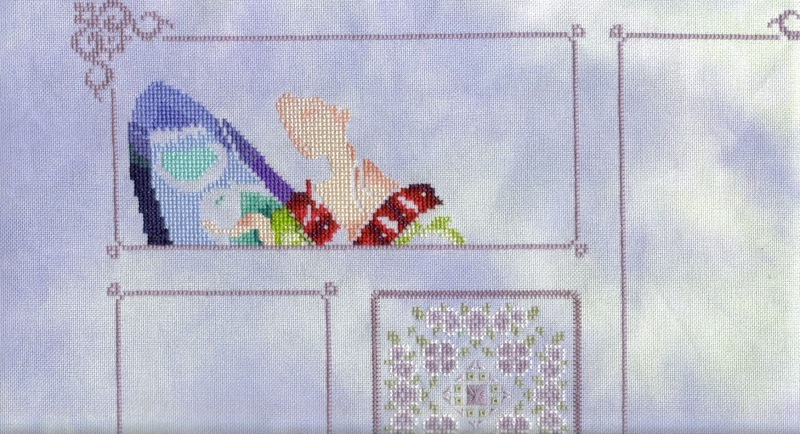 There are 10 designs, as there were 2 months where Christine gave us a break to catch up! If you'd like to come join us this year please do. 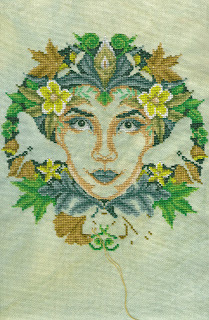 There's no pressure to stitch every month or even to finish in the month. 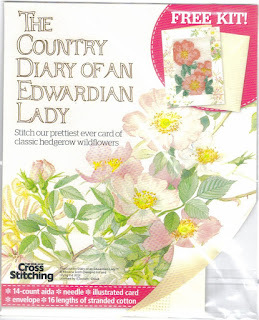 But it is a great way to stitch with friends and find some new freebies. Christine has superb taste, I really love her choices each month. Even the ones I've thought "hmmmm?" on first inspection I've loved once I got stitching. Finally, don't forget to spread some Valentine Love, click on the Heart below to sign up for the Secret Stitching Sweetheart Blog Hop. I'm Jo, your hostess for the day. I comment as "Jo who can't think of a Clever Nickname" because when I started blogstalking I was very impressed by the neat nicknames people had but couldn't think of one for myself so I thought I'd make a virtue of my lack of imagination! I started blogging nearly 2 years ago, for two main reasons. One was that I didn't like "hijacking" other people's blogs and forum threads by going off on tangents triggering by random comments within the posts. The other was that I really really wanted to join in with Daffycat's TUSAL! So here I am, 2 years later with a great group of blogging friends and followers and loving every minute of it. The name of the blog is explained in my header and comes from my love of words. So many times things have just worked out perfectly (in my stitching life at least!) and I get such a buzz from that. 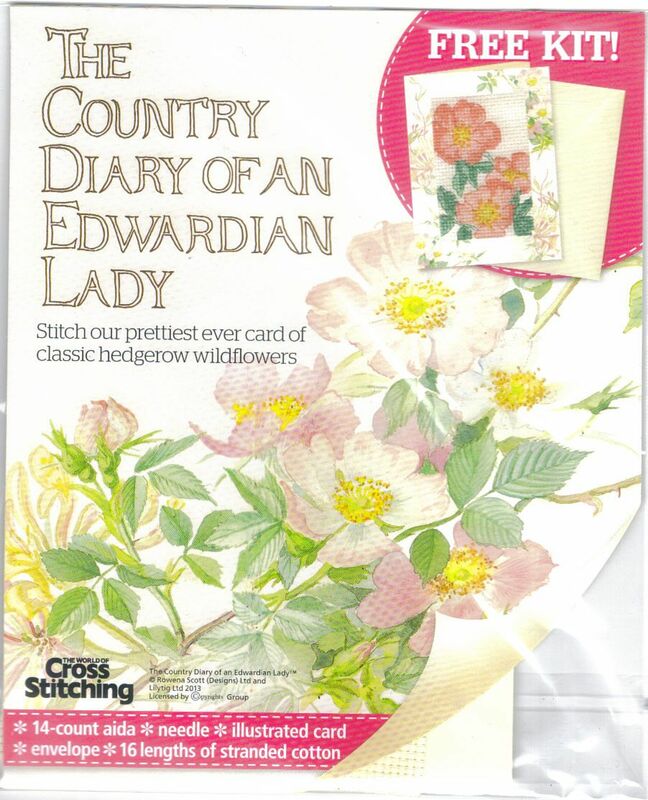 She's the January lady from the Diary which was the cover gift from World of Cross Stitching mag issue 198. 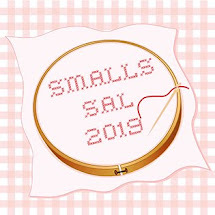 I'm in a FB SAL to stitch each of the designs this year. Joan has joined us too!! I'm stitching her on 28count evenweave with a silve sparkle woven into it. This is a Partridge (and a Dragonlet) in a Pear Tree. 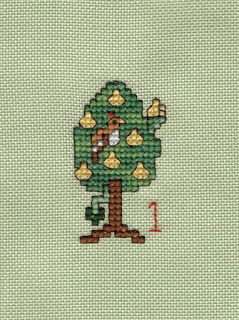 Again the plan is to stitch one a month until next Christmas then I'll make them into some sort of apres-Christmas "advent" calendar for my son who loves dragons. The final project to share with you is my evening project. I always have 2 projects on the go, a small one for daytime and a larger more complex one for the evening once the boys are in bed. At the moment it's my Mirabilia Round Robin. The blocks are twice as large as the usual 50 x 50 so there are only 4 people per group and the posting date is Monday so I don't think I'll be finishing my block by then! No prizes for guessing which design this is!! The other three will be August, July and June's Birth Stone Fairies to accompany my September Fairy. As well as stitching and blogging I do like to organise Blog Hops of my own. 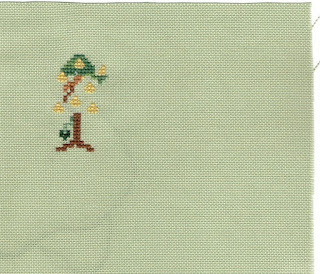 the next one is the Secret Stitching Sweetheart, all details found in this post - Secret Stitching Sweetheart. If you'd like to join in then leave me a comment, make sure your email is attached to your profile so I can contact you! 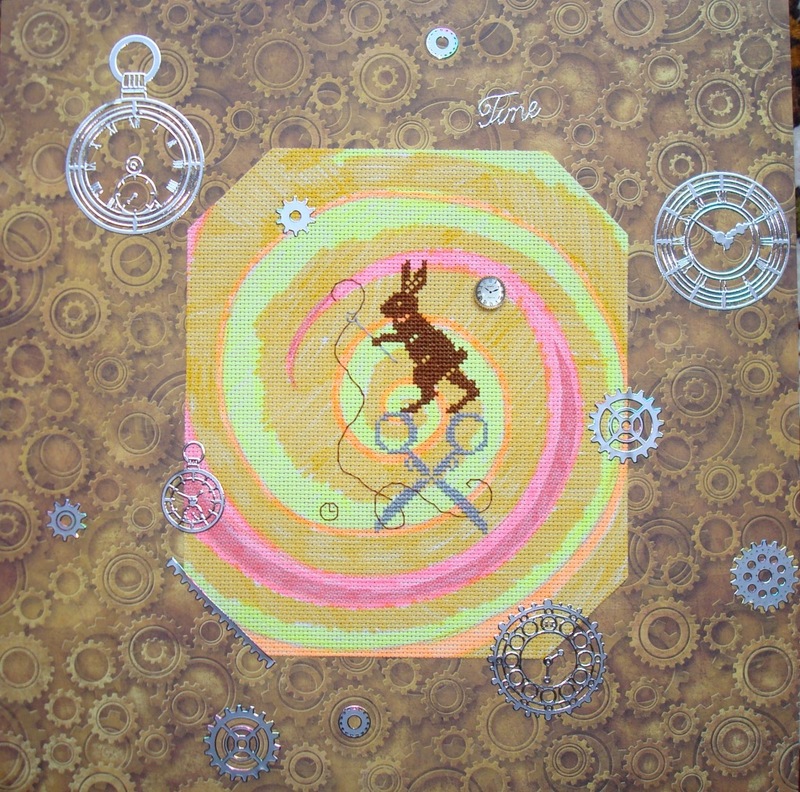 All the details for the other Blog Hops I do are found on the special page in my top tabs - blog-hops-throughout-year. 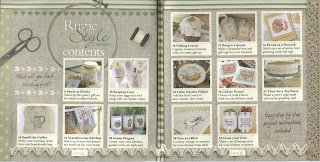 For most of them you need a blog but for Easter and Hallowe'en non-bloggers can enter the competitons too. To enter, simply leave a comment on this post ONLY telling me which prize you would like. I'll choose the winners on the 1st February. Bye for now, safe journey home! !